Confucius has correctly said- Life is simple, but we insist on making it complicated. It is the mind that bulldozes the person to do what ought not to be done. Why make life complicated when the simple solutions are just a thought away? “Freedom from the I” is a sincere attempt by Shashank Kasliwal to throw light on the delicate and hidden threads that hold the life together. It is these threads that need to be cherished and nourished so that they become stronger with each passing day. This book does not present a tale or a memoir; it is not didactic. It is a potluck of experiences and realization. It offers a simplified and more realistic approach to understand the complexities of life. 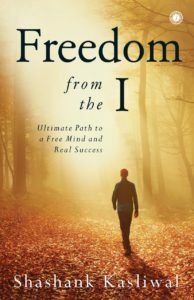 Defining the negatives in our lives in broad strokes, ‘Freedom from the I’ elicits the measures that have to be adopted by everyone to succeed. This success is an intangible entity; it is a collation of love, respect, happiness, fame and achievement. Most of the times we end up being discombobulated because of our unorganized life. The only reason behind this state of mind is the wrong perspective. Developing a perspective based on our experience of the past imprisons the mind. However, a positive outlook energizes the mind and gives it total control. The author spins the yarn of success by advising the readers to let go of Ego. Ego is that knot in the smooth thread that can increase in size and make the thread weak. The title of the book is direct and apt. The cover of the book is subtle and catchy. The editing and printing are top-notch! The author has carefully taken care of the blurb and presented it with utmost precision and care. The font (style, size) is perfect. The layout, content section, division of chapters, and the typesetting is fine. Coming to the content in the book, the book is magic. For the ones who have a flair for nonfiction books and are open to varied perspectives, this book will definitely be well liked. The author has used lucid and extremely simple language (a boon for all people in general and loss for the ones seeking creative writing). Nevertheless, this book does not leave its readers like a lost ball in high weeds, for it relates to everybody. Some of the chapters that proved out to be excellent were ‘Ego continues to live in Complaining, Thinking & Comparing’ and ‘Developing the Eye to See the I’. They are bound to ring a bell and force the readers to retrospect. Although the editing and proofreading are fine, I did not quite like the simplicity of language. But this cannot be counted as the drawback. Somewhere, the uncomplicated words forced me to toy with the idea and not ponder. But all said and done, the book definitely aces the test. The concept is worthy of appreciation.